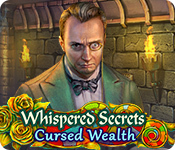 Whispered Secrets: Cursed Wealth is rated 3.2 out of 5 by 6. Rated 5 out of 5 by agatha43 from One of the best games! 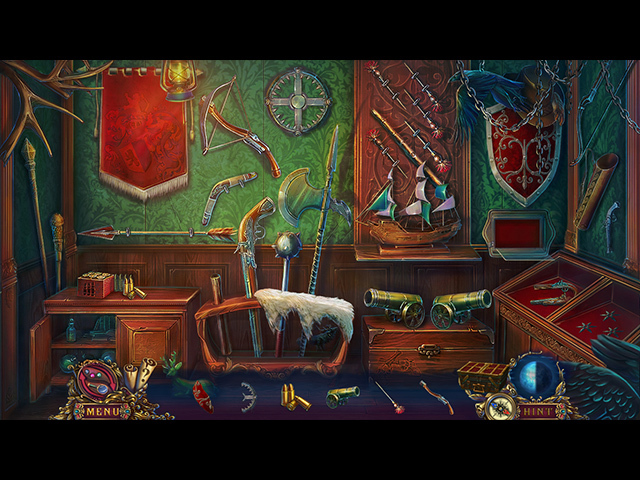 Loved the graphics, hidden objects, finding the sin cards, the morphing objects and the puzzle pieces. Rated 5 out of 5 by biscuitsmama from A JEALOUS YOUNGER BROTHER AND A MURDER SET THE SCENE FOR AN EXCELLENT GAME Whispered Secrets Cursed Wealth is the ninth game in the series. It’s been almost a year since the last game and after playing the beta I’ve been waiting for Cursed Wealth to be released. Although there is a ghost in the game, it is more of a mystery type game rather than another evil entity waiting to take over the world or to reincarnate. The storyline is interesting with the death of a bride beginning the game. As a detective and a friend of the grieving widower you are on your way to Masonville to help solve the mystery. Was the death accidental or was it murder? You will need to play this excellent game to find the answers. The overload of puzzles early in the game was a bit of overkill and I wasn’t sure that I would purchase it. It seemed like I was playing a puzzle at every turn before I could make any real progress. Get off the train and find Lord Abel’s secretary – play a puzzle, collect my luggage – play a puzzle, saddle my horse play yet another puzzle, and the list goes on. I do enjoy puzzles but not when there are twice as many as there is HOS. The puzzles are very easy but they do pick up and have at least some challenge at times. It seemed to me that the developer jumped onto the “we want more puzzles” bandwagon and just popped them in at random as game stretchers. Now that I got that off my chest, I can say that Cursed Wealth is an excellent game and one that I did enjoy even though there are more puzzles than HOS. HO scenes are what I enjoy the most in HOPA games; well those and the storyline. Others might like the puzzles more than the HOS but it would be nice to find a more equal amount of each so all gamers can enjoy each game. Even though there are not many HOS in the game they are very entertaining with just the right amount of variety. As I mentioned above there are a lot of puzzles with most being very easy. There are a few more challenging puzzles but the game is in no way a brain drain. This is an entertaining game that flows well and kept me involved. The graphics are excellent and colorful without being garish. The characters are well depicted and don’t seem to be too cartoonish. The gameplay moves along at a good pace and doesn’t seem to get bogged down with minutiae. Whispered Secrets has for the most part been a series that I have always enjoyed and Cursed Wealth is quite good. If you enjoy a good mystery game with a touch of the paranormal then you will most likely enjoy this game. If you want to get your money’s worth with a game, this CE has not only one but two bonus chapters. I purchased the game right away because from the beta I knew it was a keeper for me. Even though I really like Cursed Wealth, please try the demo to see if it is a game you will enjoy as well. Happy gaming! Rated 3 out of 5 by pnk96722 from Colors are too bright! Now, to my dismay and disappointment, we have unusually bright orange/red similar to the overly blue/purple pastel games. Realistic colors would be nice and would have prompted a purchase and 5 star rating. I realize I could probably remedy the situation by fiddling with my computer's color settings but that's not something I'm willing to do. Particularly since I know it's possible to get games with normal color and brightness. I'll say yes to recommending it and leave the color/brightness up to the viewer. Rated 2 out of 5 by roaming from It's not for me, but it might be for you. I lasted 26 minutes of the demo before giving it up. Why? Granny_Gruff pretty much said it all for me in the CE reviews: "There is a famous line: 'I do not suffer fools gladly' meaning you have no patience with those who exhibit lack of intelligence. In this game I would point to the secretary who repeatedly insists you saddle your horse, first when it is already saddled and then when you are busy trying to repair the mangy decrepit item he 'saddled' you with.... When you finally ride up to the castle, someone throws a stick of dynamite out an upstairs window, damaging the front door. That's when your character thinks how old and dilapidated the castle looks! Wanting to get inside and fearing for Lord Abel's safety, you stop to sort a cart full of vegetables and meats left standing out front in the courtyard." 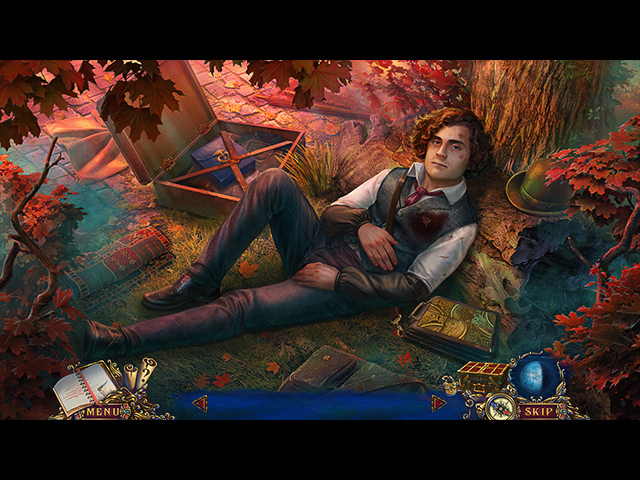 Meanwhile, Lord Abel is lying on the park bench where you placed him, possibly mortally wounded, while you run around playing puzzles and hidden object games. And last but not least, there's the gadgety "evidence box" which lights up and shakes when you need to do something with it. I've never been a fan of gadget gimmicks, nor of the whole evidence board scenarios, but a box that lights up and does the hula? Just no! Nevertheless, the graphics are decent enough, even if somewhat over-saturated with color, thereby earning a second star from me.